Since I last posted I’ve moved, spent months growing my vintage business and am back into blowing glass regularly. The recent finds section of this blog has made a move to my new blog all about collecting vintage: Ambassador of Grooviness. This fall I helped my old college glass group with their annual pumpkin sale and made some pumpkins to sell. I made several with this beautiful amber color that I have. When blown out on the pumpkin body it becomes this light amber color but stays a rich brown color on the stems. But of course it wouldn’t be fall without making lots of simple orange and green pumpkins. I’m planning on starting earlier next year and making pumpkins in the spring or summer. I’ve always done well with seasonal items and am planning on filling my Etsy shop up with pumpkins before next fall. When I started making ornaments again I was excited to find a box of glass color I’d completely forgotten about! Sometime before I moved last year I ordered some beautiful colors, boxed them up and completely lost track of them. I had a great time mixing colors (mostly transparent colors under white) to see how they’d look made into ornaments. I have a variety of ornaments available in my Etsy shop. 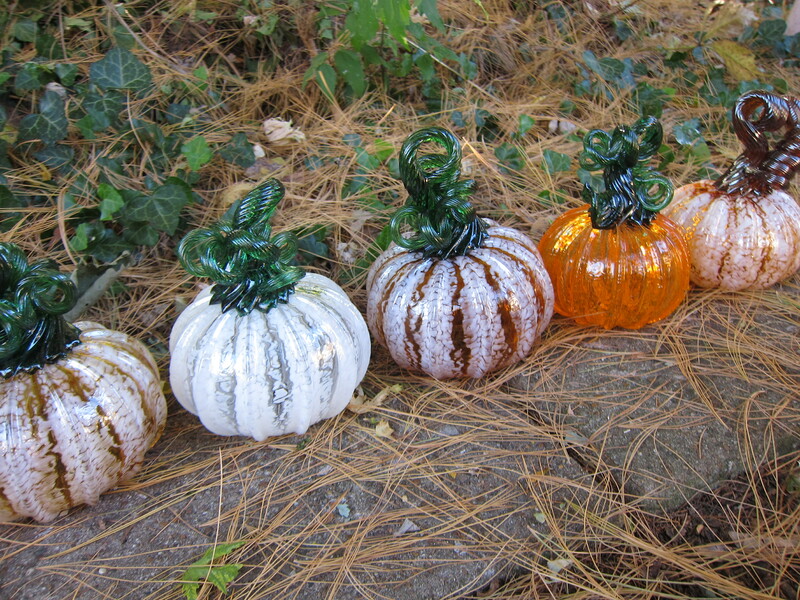 Every fall for the last 5 years or so I’ve made glass pumpkins. In college I made them as part of the glass department’s pumpkin sale/fundraiser and since then I’ve made them at another glass studio that runs a pumpkin sale. This fall I got invited back to my old college to help with their pumpkin sale in exchange for making some of my own to sell. It was a very rewarding experience. Not only did I get to make a lot of pumpkins and have fun in the process but I was able to talk to and share ideas with a lot of other creative minded people. Making pumpkins 6 hours+ a day for 2 weeks really made me think seriously about doing more production. I’ve been selling online but haven’t done much in the way of selling my own work since college. Since I’ve moved I’m only a few blocks from a public glass studio where I can rent time and I’m already thinking of things I can make and sell. I’ve sold out of all the pumpkins I’d made, so unfortunately I won’t likely have any for sale on Etsy this year. Though I am designing some Christmas ornaments that I’d like to start making and listing soon. Keep an eye on MadelineSteimleArt on Etsy and see how they turn out.